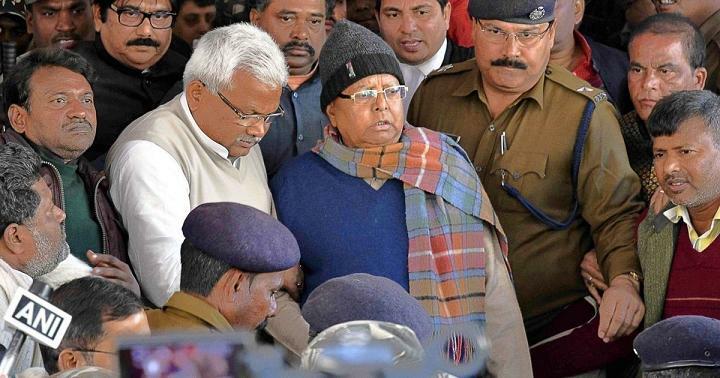 Rashtriya Janata Dal (RJD) chief and Former Bihar Chief Minister Lalu Prasad Yadav was on 6th January 2018 sentenced to 3.5 years jail in a fodder scam case. Special CBI judge Shivpal Singh announced the sentence after hearing arguments on the quantum of sentencing. Apart from Lalu, convicts Phool Chand, Mahesh Prasad, Bake Julious, Sunil Kumar, Sushil Kumar, Sudhir Kumar and Raja Ram have also been sentenced to three-and-half-years in jail and a Rs 5 lakh fine was imposed. Former MLA Jagdish Sharma got the maximum jail term, 7 years, and a fine of Rs 10 lakh was imposed on him. The sentence was pronounced through video conferencing. Lalu Yadav has said his conviction is the result of political vendetta. After the sentencing, Lalu Yadav tweeted: "Rather than practising BJP's Simple Rule - "Follow us or We will Fix you". I will die happily fixing myself for Social justice, harmony & equality."